This guide was first made as a guild thing but I later decided to post it on Nostalrius forums as there was not a similar guide there and I wanted to contribute to the community and improve the guide itself with feedback and further discussions. I have not tried every addon out there, talked to every healer or read every class guide/healer guide however this guide is based on my long time experience in playing World of Warcraft as a damage dealer, healer and lately tank as well and it has drawn from posts of Qiraji (guild) EmeraldDream (server) posts, Purge (guild) Nostalrius posts, many vanilla guides and conversations I had with many healers. Special thanks to Egregious, Scar/Aslan and Vodou/Tazvodou for their significant contributions. 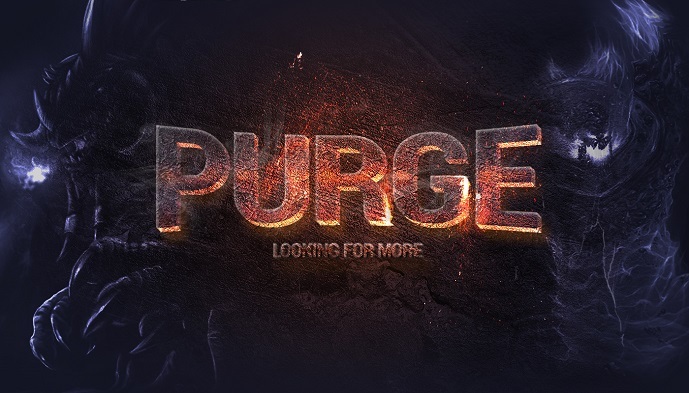 Although Purge is no longer recruiting contrary to the writing on the above image I have decided to add the image as I do recall someone (sorry forgot who) spent some time working on it and I liked it a lot and still do. Through explanation of basic healing principles and overview of what a healing team set up consists of this guide can help beginners to advance rapidly or experienced players to perfect their trade or just serve as a remainder. This guide does not contain any sort of heal bot addon and personally I don't consider the use of such addons as fair play therefore I will not be going over them although they can benefit healing when it comes to shear reaction time. As you will learn by playing the game healing is more than reaction, it is prediction. Healing is a team play; trying to achieve success by working together. Success for a healing team in vanilla WoW is everyone in your raid (including pets) surviving the fight with the least amount of mana possible used so you can continue progressing with least amount of downtime (drinking/ressing/buffing) possible. Healing is a big part of what effects whether or not everyone survives but tanks and damage dealers (DPS) will also effect it in various ways dependent on the situation. For example: fail taunt rotations (MC Lava annihilators, ZG berserkers), overaggroing (DPS taking the target focus away from the tank by overtaking the tank on the target "hatelist"), standing in fire (popular among the masses), not spreading out or spreading out, etc. Recognizing these situations and reacting to them preemptively if possible is part of what makes a good healer. Shamans will be tank healers,raid healers, dispellers or a mix thereof depending on setup, encounter and gear (full t1 shamans on tank healing only unless you have no choice because of chain heal being so much stronger than healing wave without full t1). Shamans provide totems during the whole raid and his ability is often judged on how good was his totem up time. A certain WoW patch makes it so WF applies to the weapons instantly allowing for a more efficient totem swap. Totem swapping and up time is very important for melee groups and can drastically increase their DPS. Full restoration shamans are very strong and versatile healers if properly geared. Depending on gear available to you, the length and demands of an encounter you would switch from different gear sets suiting each situation. Improved totems shamans are raid healers only and on fights where low raid healing is required they can provide nightfall or at least some dps which is better than doing almost no healing. Priests will be tank healers,raid healers, dispellers or a mix thereof depending on setup and encounter. You will often cast Prayer of Healing on your own group (on horde usually in ranged groups since shamans normally are assigned to melee groups and on alliance most often in melee groups) and keep people from death by shielding when in danger (low health/dots etc). Can spec into Power Infusion to boost casters or deep holy for more healing. Can spec 20 points in shadow to provide Shadow Weaving (+15% shadow debuff) if your setup doesn't include a dedicated Shadow Priest with the patch that allows for 16 debuff slots and if the raid is warlock heavy. Druids will be tank healers, raid healers, dispellers or a mix thereof depending on setup and encounter. They can also be useful in other ways such as feral resto druid if properly geared! So it can be used as offtank if its required also known as no other choice. Healing touch and swiftmend are both raid and tank healing speccs. You plan ahead about which items/sets would benefit the raid the most depending on your set up and tactics. Using realmplayers to calculate mana gain from mp5/spirit to determine the value ratio on mp5 and healing based on the length of the fight and damage intensity. For example a shaman with 100 mp5 in a 60 sec fight would get 1200 mana regained. From this you can conclude that the value of mp5 gear for a 60 sec fight is relatively low compared to healing. The shorter the fight is the less mp5 gear you should have if you are assigned to healing. Keep in mind critical chance for healing is almost always useless (semi useful for stacking ancestral healing and priest equivalent of the same talent for the main tank healers) as it will be overheal 90%+ of the time. Why ? When you see a player is missing 1k health you would use appropriate rank of healing spell to top him up to 100%. If you crit naturally it will be overheal. You would never use a lower heal rank spell and hope for a crit cause that is wasting your time and HPS unless you are trying to trigger the armor buff as mentioned. A crucial part of a healing team is every member of the team using the same best available addons and UI set up. Tank healing - The only difference is you are not targeting boss but your assigned tank and you can see Forecast bars above the target frame, this is where ToToT is handy as you can see boss who would in this case be ToT and you can see him changing target clearly. Although it can be a useful addon for a beginner a more experienced player will use Luna with decurse/dispell/remove poison/remove disease and /lunomo macro. This will enable you to see debuffs on raid frames and to remove the debuffs manually with direct control over your debuff removing priorities. Example would be dispelling tanks on Garr and than later on Baron not having to dispell tanks would require you to change your Decursive priorities. Another more important example would be mages having to decurse healers on Lucifron and then later any player with low health on Gehenas. Proper Gehenas fight is fast and its a waste decursing someone who doesn't actually need healing. Decursing someone on low health is of utmost importance so a heal doesn't get the 75% amount reduction. During the times I was part of guild leaderships I often found myself in arguments with players over why I demanded from them to use LUNA over anything else. Some thought GRID is better, some just didn't like LUNA for whatever reason, some preferred not to use any addon at all. During the time Nostalrius was down I played TBC and in TBC LUNA is not available. I was forced to use GRID the whole time and I can't say I hated it but I definitely missed LUNA. Main things that bothered me was not that it missed some options LUNA has but GRID missed settings to adjust these. The default settings on GRID were just awful and I found myself setting it up for a long time and in the end still not being satisfied with the results. Now there might be versions of GRID I am not aware of, maybe ones developed exclusively for vanilla like LUNA was. If anyone can confirm it and vouch its better than its TBC version I will be willing to try it and I will post a more detailed comparison. Until then I recommend LUNA without doubt over anything else. Reason I chose GRID for this "comparison" is most people (if not all) not using LUNA preferred GRID instead. Also you can set up luna to look like GRID and other raid frame addons. Dropbox may include addons that I haven't listed and explained and if you need more information about them feel free to ask or /w Kailas in game. I try to avoid using any addons that cause errors and so far I have been managing it. Supermacro and luna are the only addons you might run in problems with and this led me to using supermacro the least possible amount I can and finding vanilla macros that work without it. Luna bugging is just the inevitable consequence of luna getting bigger and having more options but its working good most of the time. TS has a nice feature called whisper lists which allows you to have separate keybind to speak to people on a particular whisper list. Enabling you to speak among your class or role without confusing the rest of the raid. Extrapolating on this: a very strong raw healer (by this I mean doing his max output of the combined use of mana pool, consumables and cooldowns) has the predisposition to become a very strong efficient healer. A very efficient healer with low Raw heal is not as likely of ever becoming a very strong raw healer unless he changes his foul ways. This means that as a healer you should work on raw heal first and when you master using all cooldowns and consumables and ending the fight with as close 0% mana, you can concentrate on using that mana more efficiently. It should be clear however when doing a speed run, everyone fully buffed and using a flask it will not be possible to spend all your mana and having some left over is very important to continue clearing straight away after a boss fight. Consumables like Demonic Runes, Dark Runes and Mana Potions are bread and butter of every healer and you should not heal any raid without them. During raid, whether you are doing a pug or a speed run, a healing team needs to be as mana efficient as possible so the raid can clear content as fast as possible and that means using consumables, drinking at any possible moment and trying to save mana so you end the fight with as much mana as possible, therefore needing to drink very shortly in which time the rest of the raid can already prepare and pull the next mob/pack/boss. If you have any questions or want to add something feel free to post here or /w me in game. Last edited by Kailas on Tue May 15, 2018 7:46 pm, edited 56 times in total. Great post man, definitely going to check out that oCB addon. Priests would primarily keep people from death by shielding when in danger (low health/dots etc). Shield sees use, but the reason it is fairly fringe is its bad scaling and the general unpredictability of much raid damage. It sure has its uses, it's not without reason I have it bound to right click, but overuse leads to inefficient healing and that in turn hurts the heal team as a whole. Overall I'd just cut the class section and leave that part to the specific class forums if someone wants to make a guide there. Priests will be a tank healer, raid healer or a mix thereof depending on setup and encounter. You will often cast Prayer of Healing on your own group (on horde usually in ranged groups since shamans normally are assigned to melee grps and on alliance most often in melee groups due to more frequent aoe damage on such groups) and keep people from death by shielding when in danger (low health/dots etc). Can spec into Power Infusion to boost casters or deep holy for more healing. Can also spec 20 points in shadow to provide Shadow Weaving (+15% shadow debuff) if your setup doesn't include a pure Shadow Priest.